Most of the movies dealing with the Iraq war have faltered. The Messenger proves an exception to the rule, a powerful and realistic drama about the stresses experienced by soldiers who return home from Iraq. That may sound like something you’ve seen before, but The Messenger feels fresh and hauntingly real. 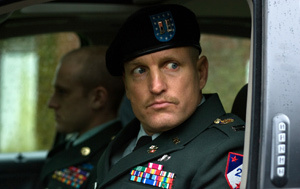 Starring Ben Foster and Woody Harrelson, The Messenger seems to have a real appreciation for the way soldiers think, at least it seemed so to me. The characters in The Messenger — which takes place after Foster’s Will Montgomery returns from Iraq — are alternately flawed and courageous; they’re convinced that the world beyond the military never will understand them. And in Will’s case, there seems to be a simmering anger thing happening, as well. The Messenger is about the ways in which soldiers are asked to suppress emotion. For Foster’s Will and Harrelson’s Capt. Tony Stone, reining in emotion is more than desirable; it’s essential. They’ve been assigned to “bereavement notification,” a job that calls for them to report a soldier’s death to his next of kin — or NOK in Army parlance. Protocol insists this job be done without touching the next of kin — a wife, a father or a mother. The soldiers are supposed to deliver the news, offer condolences and provide cursory details of how a soldier died. Nothing more. Will’s ability to hold his compassion in check is tested when he meets Olivia Pitterson (Samatha Morton). Olivia’s husband has been killed, and Will — who’s harboring his own quotient of guilt — feels a need to connect with her. Director Oren Moverman, a veteran of the Israeli Army, handles this potential romance with honesty and delicacy. It’s refreshing to watch two needy characters who are also torn by the dictates of propriety, conscience and the need to behave decently. The Messenger is a beautifully observed story about the ways in which soldiers cope with trauma. Harrelson’s Capt. Stone is a recovering alcoholic who womanizes, follows protocols and considers the military home. He’s been married three times, and is now alone. Foster’s Will, a staff sergeant, is the more complex of the two men: Will is torn by guilt, and he’s way too smart to believe that emotions entirely can be pushed aside. Small and focused — aside from a trip that the two men pay to one of Will’s former girlfriends (Jena Malone) — The Messenger is honest and affecting. Every door that opens to Will and Capt. Stone exposes them to a world of excruciating pain. When Will tells Capt. Stone the story of the combat experience he can’t shake, Moverman allows the scene to play out slowly. He reminds us of what’s possible when actors are allowed to live through a moment. By the end, we have to concede that Will is right. We can’t really comprehend what he went through in Iraq: But we certainly see what he’s going through now — and that’s plenty difficult enough.